This robust multifunction device is notably versatile for corporate, commercial print, pay-for-print, and graphic arts environments. The Xerox Colour 570 light production multifunction printer can print and copy in full colour and in high resolution, and it can also scan and fax at high speeds. Many finishing options are available for the Colour 570 printer, but they are sold separately and can be quite expensive. 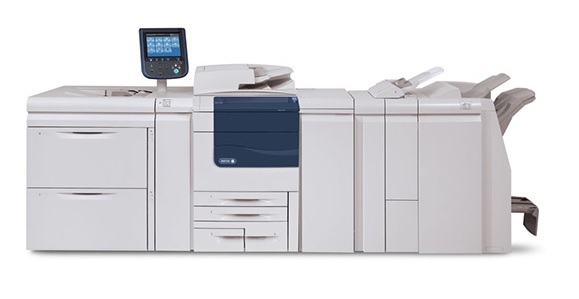 The Xerox Colour 570 multifunction printer features an adjustable colour display screen and intuitive operator panel. Four standard paper trays and a bypass tray make up the main paper feeders of the Colour 570, with 3,260 sheets as the standard capacity. The base unit is 787mm deep, 1,574mm wide, and 1,391.5mm tall. This device prints fast, with print speeds of up to 70ppm in colour and 75ppm in monochrome. The Xerox Colour 570 printer can scan directly to a USB flash drive, a computer, or email. Mobile printing is supported. Print outs are clear, sharp, and brilliant in 2400x2400dpi on a wide range of paper types, so users can create various output like posters and postcards. The Xerox Colour 570 laser printer can connect to third-party software. Built-in security features protect and monitor usage and sensitive data. Long-lasting print cartridges for the Xerox 570 colour laser printer can produce in excess of 30,000 pages per colour. The Xerox Colour 570 digital colour printer's base unit is expensive and upgrades are also pricey. The advanced, professional, and standard finishers are optional, as well as the booklet maker, hole punch, convenience stapler, and Xerox SquareFold Trimmer module. The Xerox 570 colour printer is heavy and takes up a lot of space, especially when finishers are installed on the sides.